ShukerNature: THE MONGOLIAN DEATH WORM – A SHOCKING SURPRISE IN THE GOBI? THE MONGOLIAN DEATH WORM – A SHOCKING SURPRISE IN THE GOBI? It's not every day – or every expedition – that begins with a request from a country's head of government formally requesting that a specimen be captured of a creature so elusive, and deadly, that western science does not even recognise its existence. Nevertheless, that is precisely what happened in 1922 when eminent American palaeontologist Prof. Roy Chapman Andrews met the Mongolian premier in order to obtain the necessary permits for the American Museum of Natural History's Central Asiatic Expedition to search for dinosaur fossils in the Gobi Desert. And the creature that the Mongolian premier instructed him to procure? 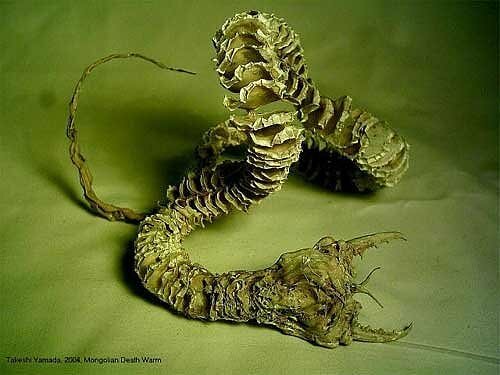 None other than the lethal allghoi khorkhoi – or, as it is nowadays commonly referred to throughout the world, the Mongolian death worm. 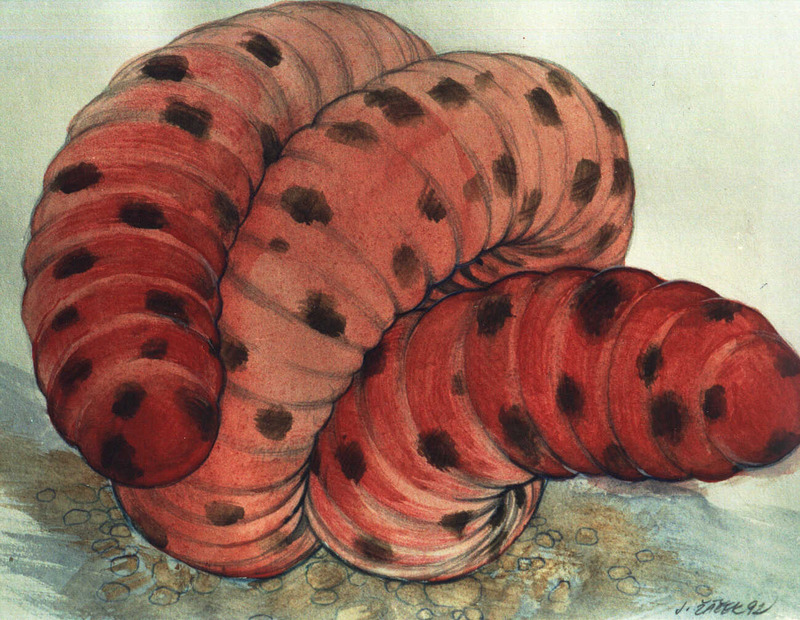 Although in the 1920s, this extraordinary mystery beast was totally unheard of outside Mongolia, today it is one of the most (in)famous of all cryptozoological creatures – thanks to the series of pioneering expeditions to its southern Gobi homeland launched by Czech explorer Ivan Mackerle, the first of which took place during June and July 1990, and which subsequently attracted considerable interest internationally. 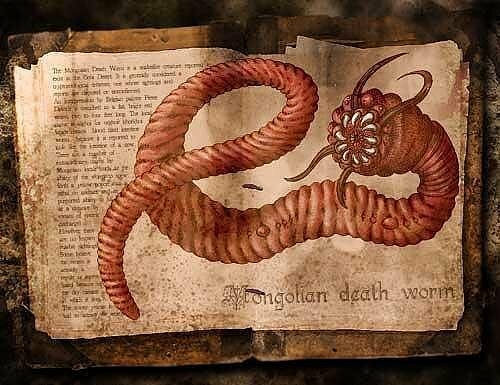 During his searches, Ivan collected a very impressive dossier of information concerning the death worm, based upon eyewitness reports and other anecdotal evidence, which he subsequently made freely available to me to use as I wished in my own writings, and which can be summarised as follows. Its local names – allghoi khorkhoi and allergorhai horhai – translate as 'intestine worm', because according to eyewitness testimony, this mysterious sausage-shaped creature resembles a living intestine. Red in colour with darker blotches, it measures 1-1.6 m long and is as thick as a man's arm, but has no discernable scales, mouth, nor even any eyes or other recognisable sensory organs. It is said to be truncated at both ends, but according to some accounts at least one end also bears a series of long pointed structures at its tip. For much of the year, the death worm remains concealed beneath the Gobi's sands, but during the two hottest months – June and July – it can sometimes be encountered lying on the surface, particularly after a downpour of rain. Locals claim that it can also be found in association with the black saxaul Haloxylon ammodendron, a yellow-flowered desert shrub, whose roots are parasitized by the goyo Cynomorium songaricum – a strange, cigar-shaped plant of uncertain taxonomic affinities. According once again to local lore, the death worm is deadly for two very different reasons. If approached too closely, it is said to raise one end of its body upwards (as portrayed on the front cover of my book The Beasts That Hide From Man, 2003), and then squirt with unerring accuracy at its victim a stream of extremely poisonous, acidic fluid that burns the victim's flesh, turning it yellow, before rapidly inducing death. It is claimed that the death worm derives this highly toxic substance externally - either from the saxaul's roots or from the goyo attached to them (and thereby reminiscent of how South America's deadly arrow-poison frogs derive their skin toxins from certain small arthropods that they devour). During my own researches, however, I have uncovered no evidence to suggest that the saxaul's roots are poisonous, and I have revealed that the goyo is definitely not poisonous (it is eaten as famine food, and used widely in Chinese herbalism). So if the death worm truly emits a venomous fluid, it presumably manufactures it internally, rather than deriving it externally. Even more shocking – in every sense! – is the death worm's second alleged mode of attack. Nomadic herders inhabiting the southern Gobi tell of how entire herds of camels have been killed instantly merely by walking over a patch of sand concealing a death worm beneath the surface. 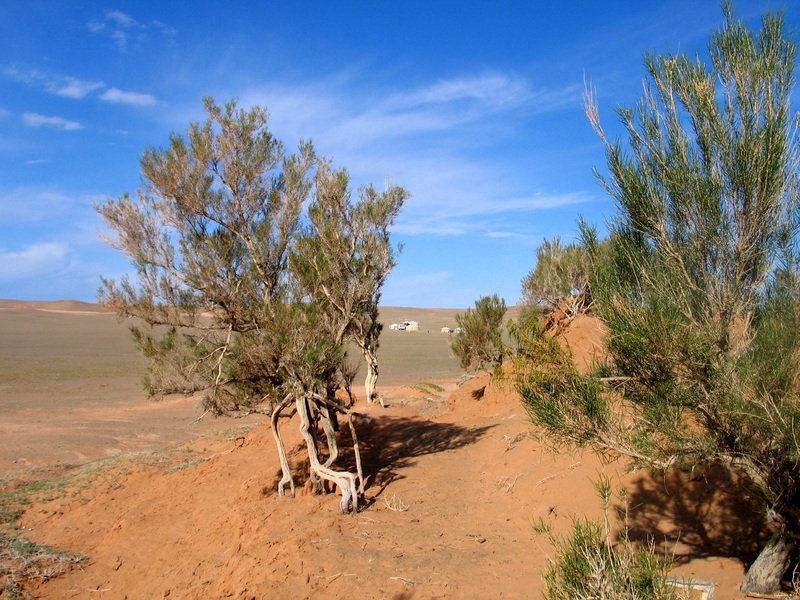 Moreover, one of Ivan Mackerle's local guides recalled how, many years earlier, a geologist visiting the Gobi as part of a field trip was killed when he began idly poking some sand one night with an iron rod – as he did so, he abruptly dropped to the ground, dead, for apparently no reason, but when his horrified colleagues rushed up to him, they saw the sand where he had been poking the rod suddenly begin to churn violently, and from out of it emerged a huge, fat death worm. The camels presumably died from coming into direct physical contact with the death worm hidden beneath their feet, but the geologist only touched it indirectly, via the metal rod. Consequently, the only conceivable way that this action could have caused his death is by electrocution – which would obviously explain the camels' instant deaths too. Although there are several different taxonomic groups of fish containing species that can generate electricity – including the famous electric eel and gymnotids, as well as the electric catfish, electric rays, mormyrids, rajid skates, and electric stargazers – no known species of terrestrial creature possesses this ability. So if the native claims concerning the camels and the geologist are correct, and always assuming of course that it really does exist, the death worm must be a very special animal indeed. But what precisely could it be? 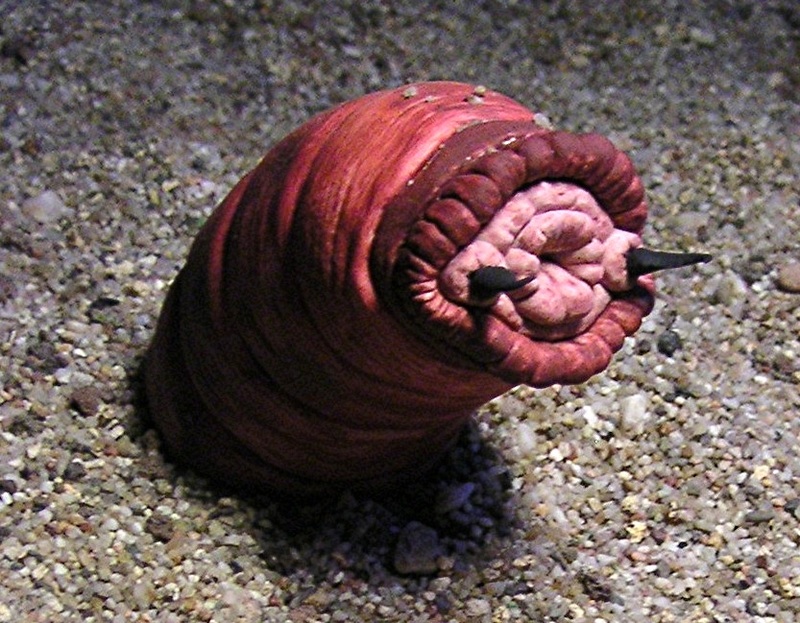 Despite its English name and superficially similar external appearance, it is highly unlikely that the death worm could be a bona fide earthworm or related invertebrate. For although some earthworms do grow to prodigious lengths, and certain species known aptly as squirters even spurt streams of fluid from various body orifices, none exhibits a water-retentive cuticle, which would be imperative for survival in desert conditions to avoid drying out. Of course, there may be a highly-specialised earthworm in the Gobi that has indeed evolved such a modification, but with no precedent currently known, the chances of this seem slim. In addition, if the death worm's powers of electrocution are real, this would require even more modification and specialisation for an earthworm to fit the bill. 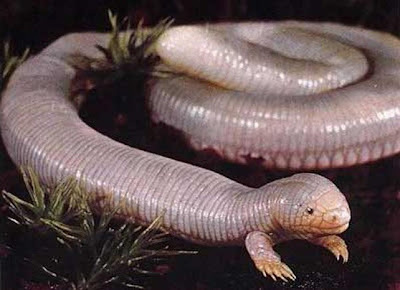 Caecilians constitute a taxonomic order of limbless amphibians that are deceptively worm-like in appearance and predominantly subterranean in lifestyle. Certain species can also attain a total length matching the dimensions reported for the death worm. 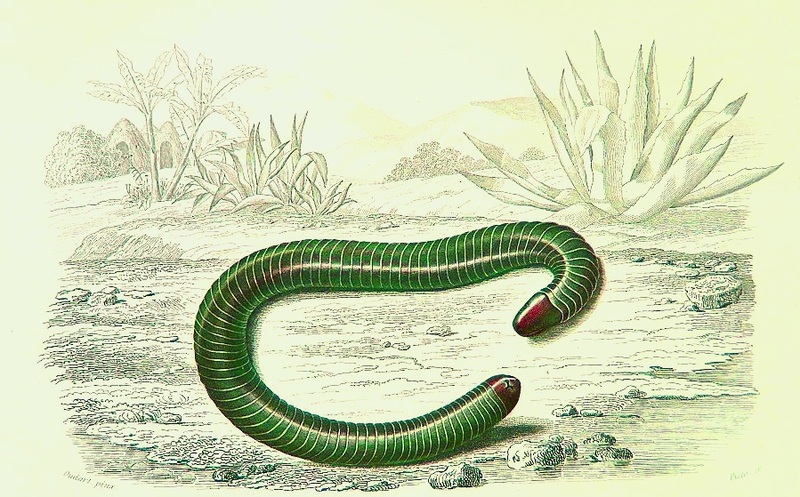 As with true worms, however, caecilians' skin is water-permeable, so once again even a giant caecilian would soon dry out in the arid Gobi, unless, uniquely among these particular amphibians, it had evolved a water-retentive skin. If the death worm is genuine, it is almost certainly some form of reptile. To my mind, the likeliest solution is an unusually large species of amphisbaenian. On account of their vermiform appearance (most species are limbless), these little-known reptiles are also called worm-lizards, even though, taxonomically speaking, they are neither. As with caecilians, they spend much of their lives underground, rarely coming to the surface except after a heavy fall of rain. This all corresponds well with the death worm's reported behaviour. Furthermore, unlike real worms and caecilians the skin of amphisbaenians is water-retentive, so a giant species would not dry out in the Gobi. 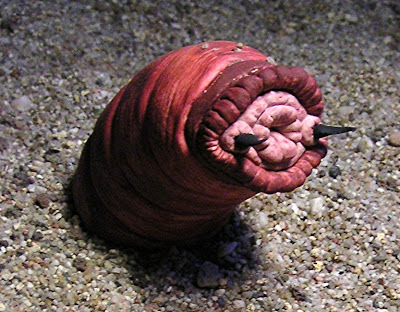 Conversely, whereas the death worm is said to be smooth externally, amphisbaenians are very visibly scaly, and they also have a readily-observed mouth. In addition, they are all completely harmless, which wholly contradicts the twin death-dealing talents attributed to the Gobi's moat greatly-feared denizen. Naturally, it is conceivable that these abilities are entirely apocryphal, nothing more substantial than superstitious fancy. After all, several known species of amphisbaenian, and also caecilian, are fervently believed by their local human neighbours to be deadly poisonous even though in reality they are wholly innocuous. 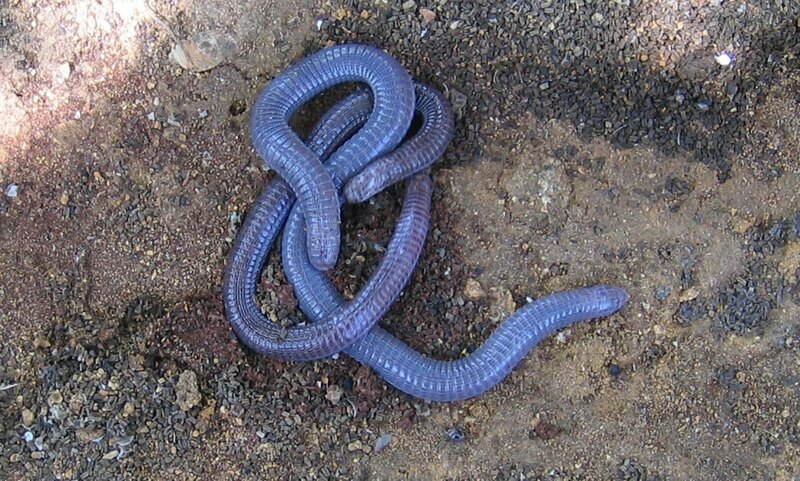 Much of what has been proposed for and against an amphisbaenian identity for the Mongolian death worm applies equally to the possibility of its being an unknown species of very large legless true lizard - akin perhaps to the familiar slow worm and glass snake, or even to the skinks, some species of which are limbless. 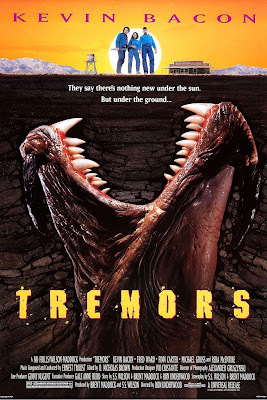 However, these lizards are much less worm-like and subterranean than amphisbaenians, so overall the latter provide a more satisfactory match with the death worm. Last, but by no means least, is the thought-provoking prospect that the death worm may be a highly specialised species of snake. Not only do most of the above-noted physical and behavioural similarities between the death worm and the amphisbaenians and legless lizards apply here too, but spitting cobras also offer a famous precedent for an elongate creature that can eject a stream of corrosive venom with deadly accuracy at a potential aggressor. 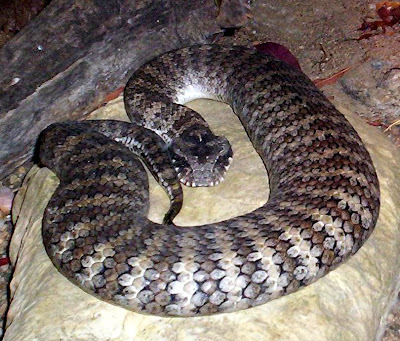 Moreover, the spine-bearing tip described for the death worm recalls a genus of cobra-related species known as death adders Acanthophis spp., which possess a spiny worm-like projection at the tip of their tail that acts as a lure for potential prey. Their name recognises the fact that although, like cobras, they are elapids, the death adders have evolved to occupy the ecological role filled elsewhere by true vipers. Could there be a specialised, unknown species of death adder that has evolved the venom-spitting ability of its spitting cobra relatives? If so, this would vindicate the locals' testimony concerning the death worm's emissions. But what about its alleged powers of electrocution? Remarkably, this too may be more than just a myth. For if the death worm were indeed a snake and perhaps sported such smooth, fine, tiny scales that they were not readily discernable, when it was crawling through sand these scales may be able to generate a weak electrical current via friction – a process known as triboelectricity, which has already been documented from certain sand-dwelling snake species. If this in turn gave rise to exaggerated descriptions of its potency, it is easy to see how, over the course of several generations of ever more fanciful retellings, the entirely false belief in a creature that kills by electrocution could ultimately arise. So could it be that in spite of the death worm's initially unlikely form and behavioural proclivities, there actually could be a real, scientifically-undescribed species at the heart of this longstanding mystery, albeit one far less flamboyant and formidable than the version described in local testimony? Or is the entire death worm scenario nothing more than native folklore? 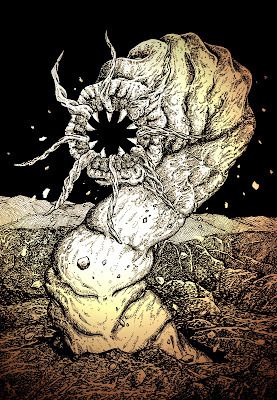 Science-fiction devotees reading about the Mongolian death worm will undoubtedly recall Frank Herbert’s celebrated series of 'Dune' novels. These were set on a desert planet called Arrakis – home to an enormous species of vibration-sensitive sand worm called the shai-hulud, which could be ‘called’ to the surface when the planet’s human inhabitants used a vibration-engendering device known as a thumper. In a classic scenario of transforming science-fiction into science fact, and directly inspired by the 'Dune' stories, during his first Gobi expedition Mackerle and his team tested out their very own specially-constructed thumper, but to no effect. 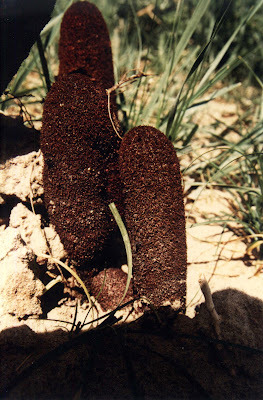 During their second Gobi expedition, clearly favouring a more emphatic approach this time, they set off a number of controlled explosions in areas said by the locals to harbour subterranean death worms, in the hope that the massive vibrations elicited by these explosions would stimulate the worms to surface. Sadly, however, their summoning again went unheeded, as no worms appeared. Moreover, in recent times several expeditions other than those of Ivan Mackerle have also searched the southern Gobi's vast terrain in search of its purported 'monster', but once again none has met with any success so far. These include an expedition led by English cryptozoological field researcher Adam Davies in 2003, a team sent out by the Centre for Fortean Zoology in 2005, and more recently a two-man expedition led by New Zealand journalist David Farrier in August 2009. Unfortunately, none succeeded even in seeing, let alone capturing, a death worm (a local man informed the CFZ team that on one occasion a killed specimen had been taken away by Russian zoologists, but he did not provide any names or details that could be pursued). Nevertheless, some informative anecdotal evidence has been gathered, and both the Adam Davies-led team and the CFZ team observed and photographed a carving of a supposed death worm (although it sported eyes) on exhibition at the remote Gobi Museum. Most telling of all, however, as some of these later expeditions were startled to discover, the newest generation of Gobi nomads are as likely to be riding desert motorbikes as camels, and some even carry mobile phones inside the folds of their traditional desert robes. So perhaps they are also heeding less and less the traditional stories and beliefs of their elders. Having said that, there may be another, very different reason why these expeditions have returned empty-handed. Some locals claim that death worms have been seen far less frequently in recent years than in the past. 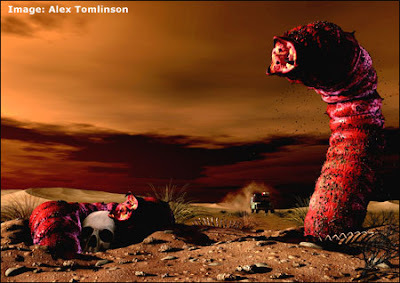 Who knows - perhaps, just as the rest of the world has finally started to learn about and become interested in it, the Mongolian death worm has begun slipping inexorably into extinction. How ironic that would be – almost as ironic, in fact, as Prof. Roy Chapman Andrews's straight-faced promise to the Mongolian premier back in 1922 that if his expedition did indeed encounter a death worm during their search for dinosaur fossils in the Gobi, they would do their best to secure its capture using a pair of long steel collecting forceps. 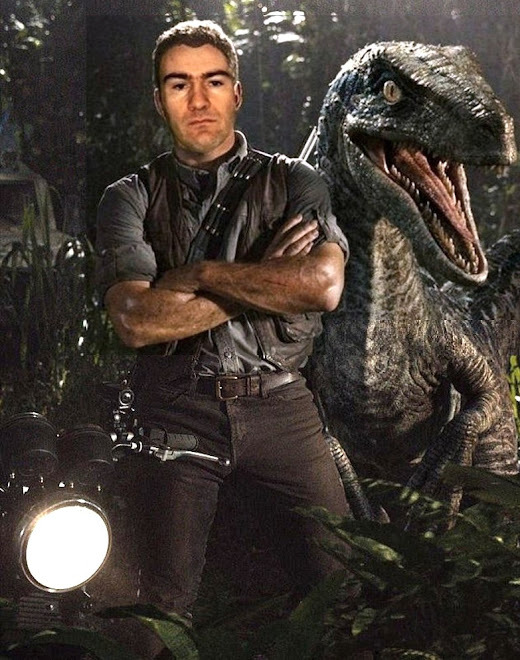 In view of what reputedly happened to the hapless geologist who poked one of these fearful creatures with a metal rod, it's probably just as well that Prof. Andrews and his team never did find any! 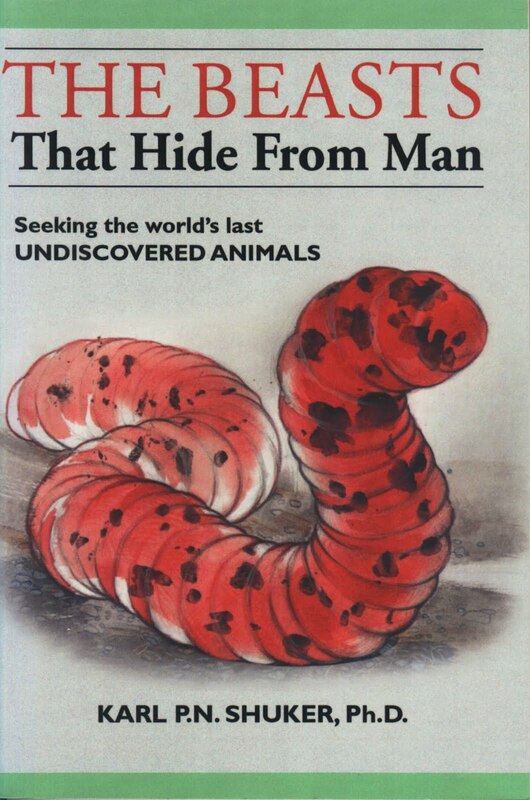 For the most detailed, comprehensive coverage of the Mongolian death worm ever published, see my book The Beasts That Hide From Man (Paraview: New York, 2003). Glad you could clear up some misconceptions about the death worm. I am interested in the snake hypothesis. I wonder if the snakes could have used a specialized form of scales to purposefully produce triboelectricity as a weapon? It's a frightening thought. Lampreys, unlike lungfishes, do not aestivate (undergo summertime hibernation), and even if they could, they could only survive in this state for a limited time - ultimately, they would need to return to water, whereas this return could not happen in the Gobi Desert, as rain alone would be insufficient to sustain them. Also, although they are superficially eel-like externally, lampreys are wholly unrelated to eels, belonging to an entirely separate taxonomic class of vertebrate, and are much simpler, more primitive organisms than eels. But thanks for the interesting suggestion, and I'm glad that you found my article interesting. I have actually eaten goyo. It tastes like banana and has a texture like celery. The locals think the deathworm is not becoming rarer but is see less due to people travelling by motor bike rather than horse or camel. That said we talked to about two dozen witnesses. I concluded the animal was an unknown type of large amphisbeana. 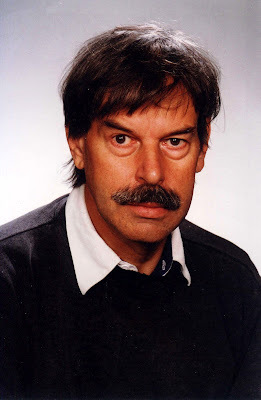 Hi Rich, Yes, I mentioned the motorbike link here too, and I too support the amphisbaenian identity, right from when I first documented the death worm back in the late 1990s - it fits the bill more closely than other identities. Interesting to know what goyo tastes like! I think there would be a market for goyo in the west. It's an ugly looking thing but the taste is lovely. 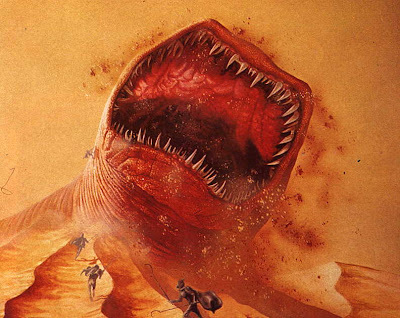 Did Ivan Mackerle create a topographic map with thematic detail for specific locations for the Mongolian Death Worm sightings? Not as far as I'm aware. The Gobi Desert is around 500,000 square miles in area, so that's a lot of desert to document. There are a number of bizarre giant worm sightings which exhibit similar characteristics of having no discernible features. The difference is that when they do open their eyes, they are big and bright blue. See About.com and "The creature of the dump" for the details. There's more stories too. My hypothesis is that they are giant flying bug larvae, also a solution to the UFO phenomena. A four foot wingspan giant bug was seen by multiple witnesses on an airliner at 30,000ft. "Mongolian Death Worm" was an absolute crapfest. Filmed in Texas grasslands, the Mongolian officer looked and sounded like a Texas Ranger. I use the DVD as a coaster! What about the Josh Gates expedition ware they found 1? But that's just it, they DIDN'T find one - had they done so, it would have made headlines worldwide. All that they did find is something that MAY, just MAY, have been a death worm's burrow, but there is no serious evidence that it was, just conjecture. I don't really know but isn't there an expedition where a assistant met one and tried to capture it and put it in a container but it escaped by spitting out acid to melt the container? 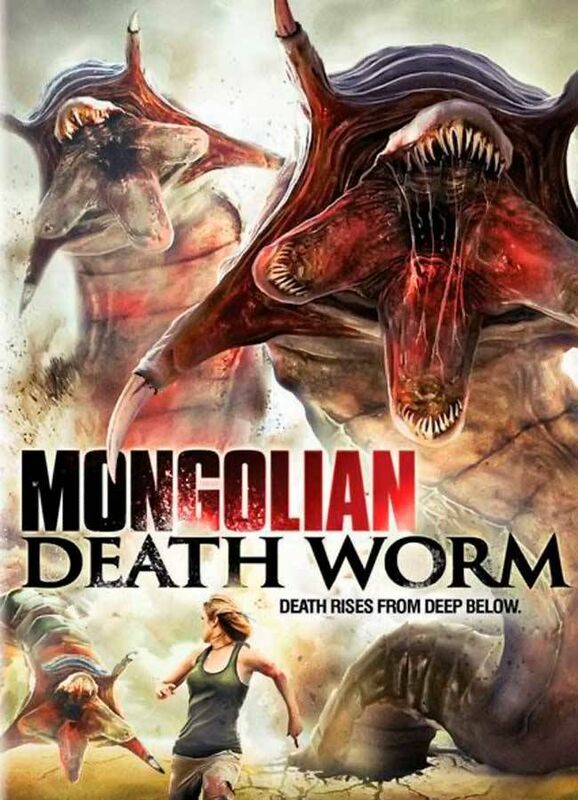 I don't want to meet the mongolian deathworm when i go to Gobi Dessert. It so Scary Animal!!! If the Mongolian Death Worm is closely associated with the Cynomorium, as you suggest, then it could be a trade protection tale. The collection of suǒ yáng Cynomorium coccineum subsp. songaricum for use in Chinese herbalism was and is still a very large and valuable trade. It is used as an aphrodisiac and sexual medicine particularly against impotence and infertility. Among other things it nourishes the sinews and moistens the intestines. Contraindicated in those with excessive erections. First mentioned in China in the text "Supplement to the Extension of the Materia Medica" from 1347 CE.